My apologies to those who follow my blog … I’ve been absent from making any post for some time. 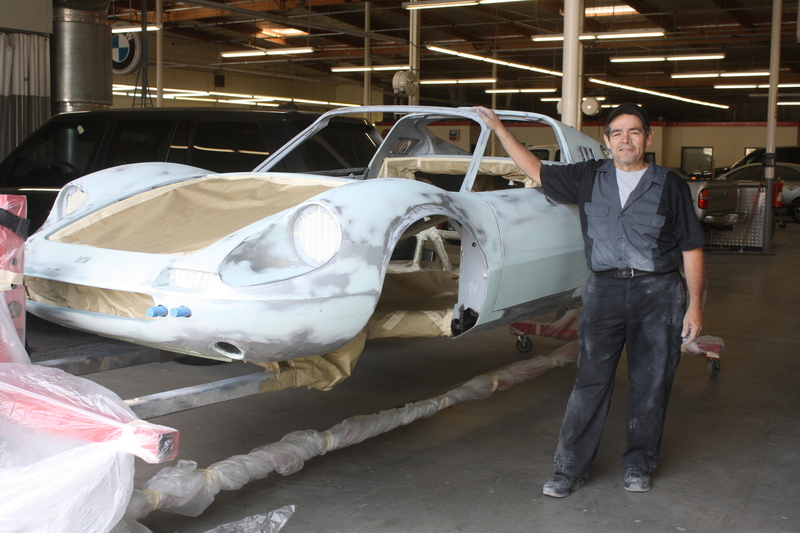 Mainly because I’ve been knee deep in Dino re-surfacing and the Miura we’ve got in the shop. I’ve tried to keep the threads on Ferrarichat up to date but even that is far from what I’d like. 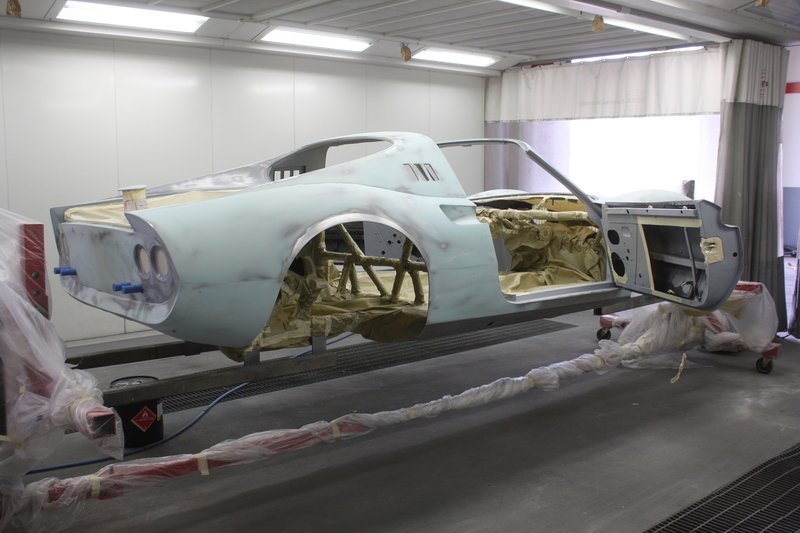 In any event, I’d like to update you on the “Barn Find” Dino that’s in for re-surfacing and a new-color paint job. We finished the body and metal work early last week. After several days of pre-primer surfacing we were able to roll it into the spray booth for 3 hours of primer spraying (no body said it was easy… or quick!). 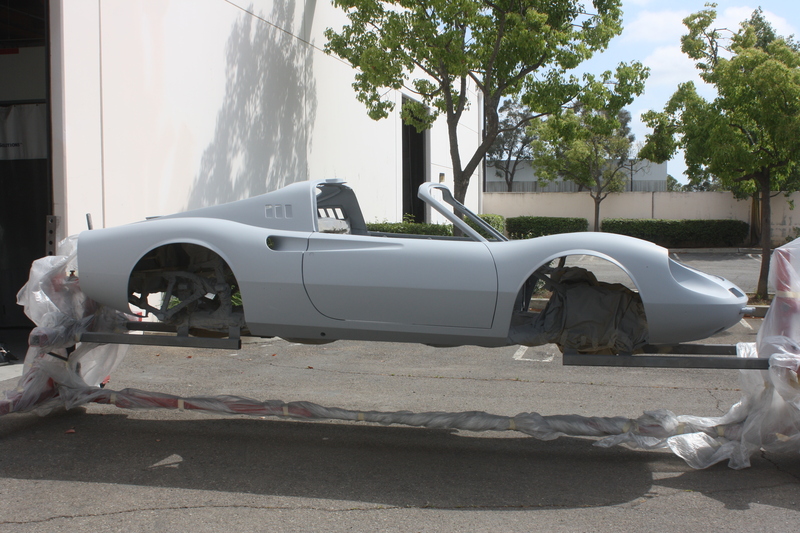 Once a car gets ready for its first primer we consider it in the “paint stage”. The first thing we do is spend about 2 hours blowing the car off and wiping it down before moving it into the spray booth. 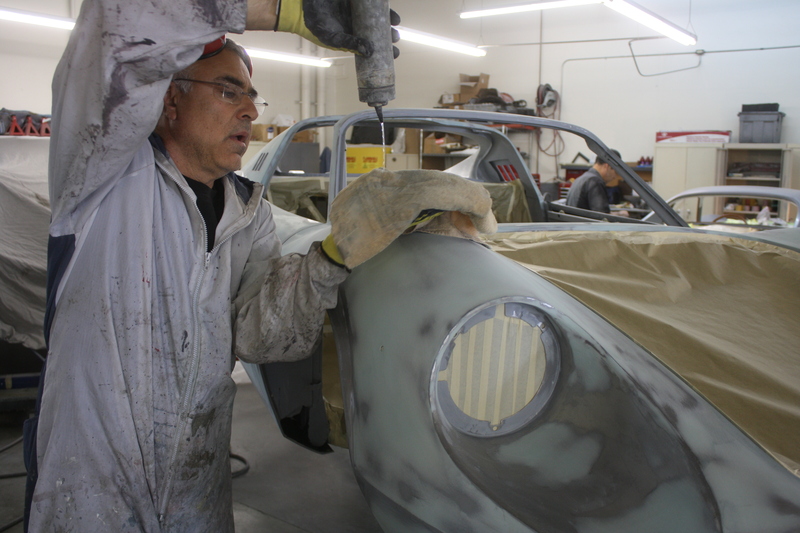 Then we move it into the spray booth, set it up to receive primer, and wipe it down again before we start the 3-hour long session of actually spraying primer. Mike came in to help service this Dino. 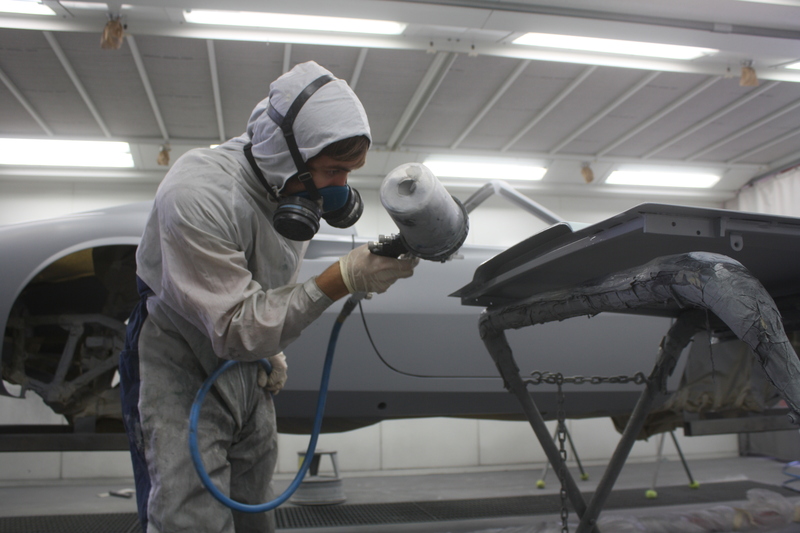 He’s an old time friend and we both worked together at Metalcrafters and my old shop – Auto Cosmetic, Inc.
Beau’s been with me for nearly two years and he’s really getting the technique of spraying primer down. He had a chance to show his craftsmanship on this job. Here he is spraying the parts for me and did an awesome job! It’s nice to know that all I’ve learned over three decades will be passed on! Once the priming is done, it stays in the spray booth overnight to dry. The next day we roll it out into our bright California sun for some more “baking”. The priming turned out great! It’s a perfect foundation for the rest of the paint stage. This stage is the time where you can read all the lines and fine-tune them. It’s always an accomplishment to get primer on your surface because you need the material to work with in order to build your surface up correctly to achieve a flat body. 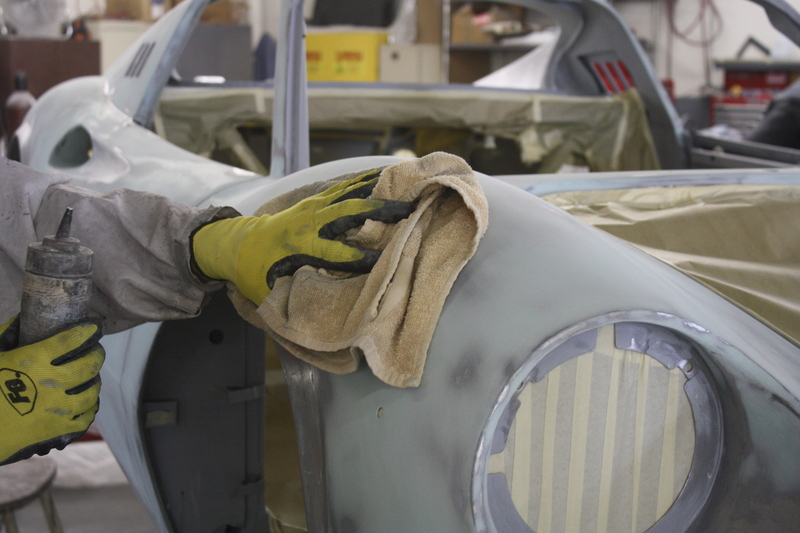 The car gets primed twice… maybe three times. After each primer the car gets block sanded (also not easy or quick) and it’s easier now to read the surface and to see and check all the shut gaps. We’ll easily put in another 200 hours just in the paint stage of the job. But it’s well worth it to get the finish I want on my jobs. I consider each of my paint jobs a calling card and a piece of art. I also consider each job a reflection of my artistry as well as the 30+ years of craftsmanship I’ve honed. I work to make every surface a reflection of my passion. Hello Steve… Great guy’s here, and a fantastic place. Awesome, Awesome, Awesome, Stevie, you are the master. If I was a Ferrari I would want to live in your garage and have you as my owner! Wow, what TLC.